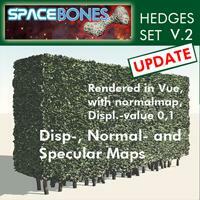 These are the maps for the updated hedges set, all in .jpg format! I had great results in Vue with "Displacement" checked and rather small values. You will have to experiment, like always. Thank you so much for all the high quality models your create and share!